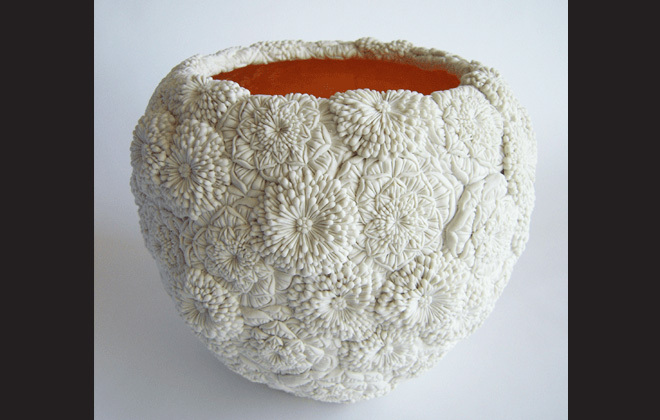 What breathtaking porcelain pieces by Hitomi Hisono. I discovered her purely by accident whilst deep in the Instagram hole that I can find myself in these days. Somehow there she was. Stunning, isn’t it? 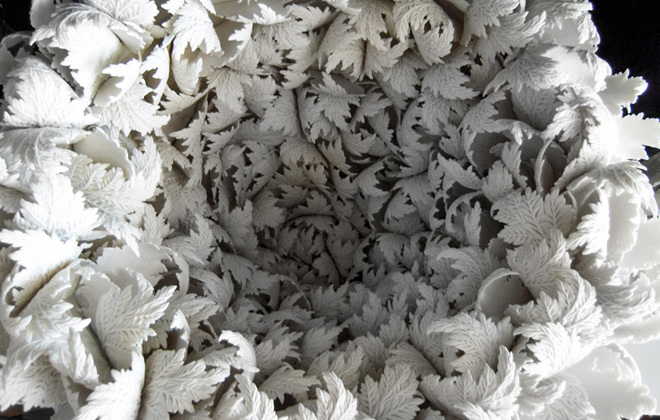 What truly incredible detail she achieves as a ceramacist. It is impossible for me to imagine the amount of patience and skill it would take to carve something like this. Time now for a little bit about the artisan. Hitomi lives in London, but before arriving in the UK she studied Kutani Pottery in Japan as well as ceramic product design in Copenhagen. 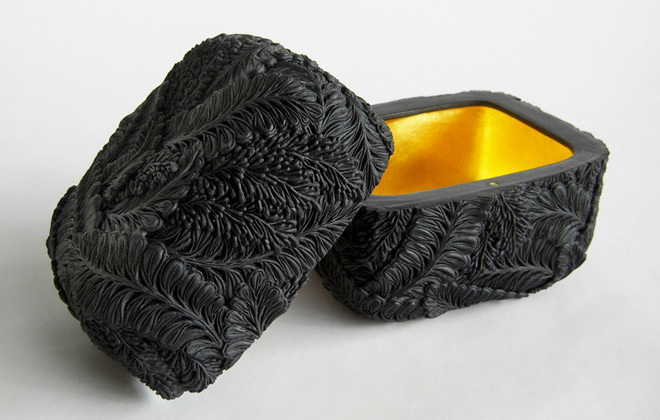 She graduated with an MA in Ceramics & Glass from the Royal College of Art, London, in 2009. I had to research Kutani pottery in order to better understand what it really was all about and to know if that was informing Hitomi’s porcelain style. Turns out that Kutani is a style of Japanese porcelain first established in 1655, by a member of the Maeda clan who set up a kiln in the village of Kutani, Japan. The porcelain style is known for multiple colors—such as greens, blues, yellows, purples, and reds—and bold designs covering most of the surface of each piece. It also turns out that it really has nothing to do with Hitomi’s style at all! Perhaps the only overlap is with her affinity towards the intricacy of plants and that Kutani pottery usually depicts plants and flora. Hitomi carefully examines all the veins of a leaf, how its edges are shaped and the layering of a flower’s petal. She studies botanical forms in the garden, and also recollects memories of nature from her childhood in Japan, where her family runs a small rice farm. 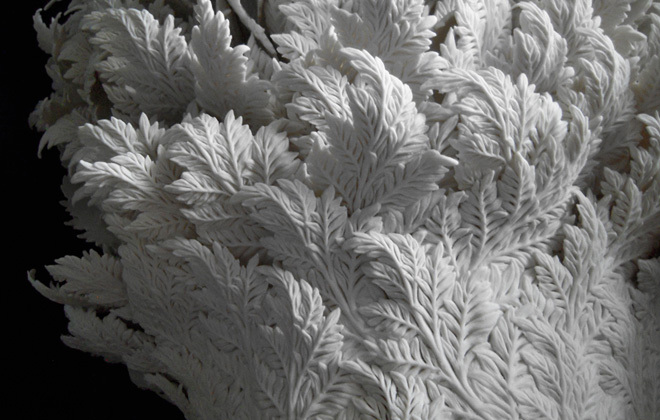 She has said that it is her intention to transfer the leaf’s beauty and detail into her ceramic work, using it as her own language to weave new stories for objects. What new stories she is telling! It is unlike anything I have seen before. I can’t stop thinking about having one of her pieces in my own home. Only hindrence might be that it will cost me thousands to do so. Ah well, one can dream. Stunning details on this piece. It looks like it could be coral. Amazing piece. This might be my favourite. Inside detail of that same piece. I now have to tell you about her process because is is fascinating. 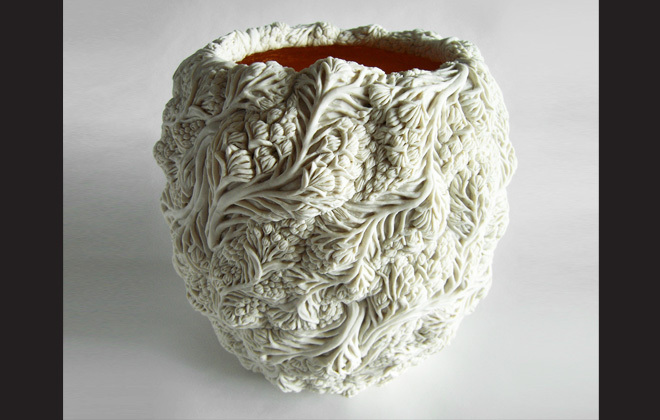 Hitomi uses the same technique initially inspired by Josiah Wedgwood’s Jasperware, in which thin ceramic relief, or ‘sprigs’, are applied as surface decoration to a piece. Hitomi wanted to make innovative pieces featuring the sprigging technique but she hoped to move away from the traditional use of sprigs solely as ornament. 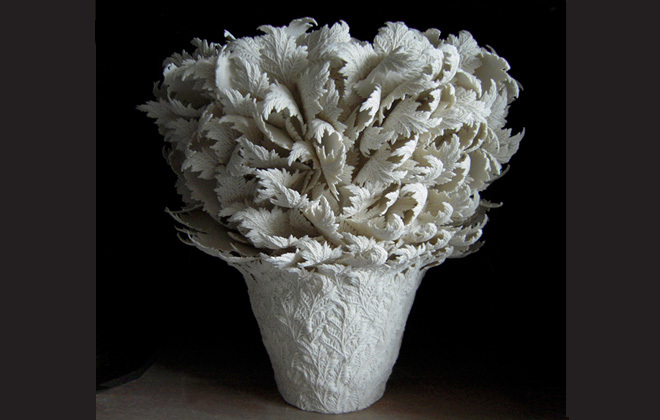 She attempted to work with ceramic sprigs in a new sculptural way. 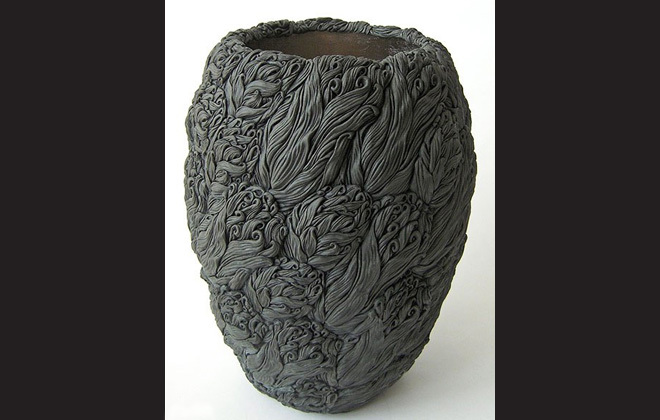 Extensive experimentation with different methods and clay bodies enabled her to create two new ways to use the sprigging technique. 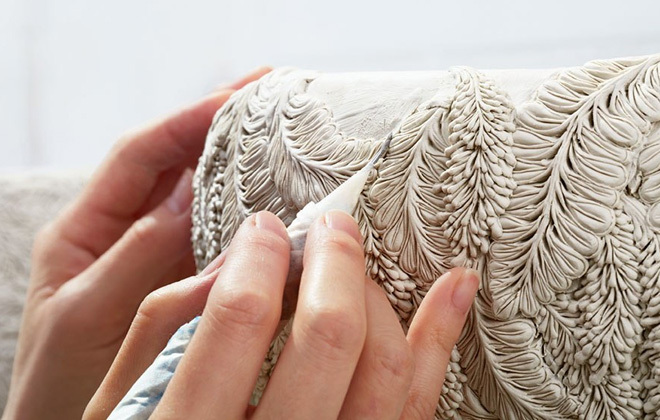 One is to cover the entire surface of a shape with sprigs while the other is to construct the art object solely out of many layers of the relief, carving each with modified dental tools to add incredibly fine details. I want to have this on my dresser. It is just beyond with that gold interior. Truly magnificent craftsmanship, isn’t it? Her work is featured in numerous places such as the V & A museum in London and she will be at the Sassoon booth at New York City’s Salon: Art & Design fair in November. I won’t miss it! Meet me there.